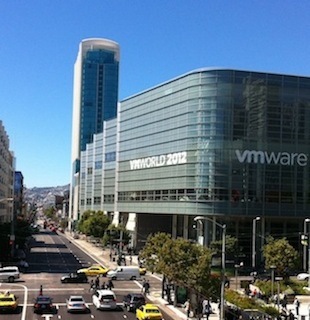 [This post was updated after being published to delete NDA material – sorry, RL] Attended VMworld2014 in San Francisco this past week. Lots of news, mostly about vSphere 6 beta functionality and how the new AirWatch acquisition will be rolled into VMware’s End-User Computing framework. Virtual Volumes (VVOLs) is in beta and extends VMware’s software-defined storage model to external NAS and SAN storage. VVOLs transforms SAN/NAS storage into VM-centric devices by making the virtual disk a native representation of the VM at the array level, and enables app-centric, policy-based automation of SAN and NAS based storage services, somewhat similar to the capabilities used in a more limited fashion by Virtual SAN today. Storage system features have proliferated and differentiated over time and to be able to specify and register any and all of these functional nuances to VMware storage policy based management (SPBM) service is a significant undertaking in and of itself. I guess we will have to wait until it comes out of beta to see more. NetApp had a functioning VVOL storage implementation on the show floor. Virtual SAN 1.0/5.5 currently has 300+ customers with 30+ ready storage nodes from all major vendors, There are reference architecture documents and system bundles available. vRealize Suite extends automation and monitoring support for a broad mix of VMware and non VMware infrastructure and services including OpenStack, Amazon Web Services, Azure, Hyper-V, KVM, NSX, VSAN and vCloud Air (formerly vCloud Hybrid Services), as well as vSphere. vCenter Site Recovery Manager (SRM) 5.8 – provides self service DR through vCloud Automation Center (vRealize Automation) integration, with up to 5000 protected VMs per vCenter and up to 2000 VM concurrent recoveries. SRM UI will move to be supported under vSphere’s Web Client. vSphere Data Protection Advanced 5.8 – provides configurable parallel backups (up to 64 streams) to reduce backup duration/shorten backup windows, access and restore backups from anywhere, and provides support for Microsoft Exchange DAGs, and SQL Clusters, as well as Linux LVMs and EXT4 file systems. VMware NSX 6.1 (in beta) has 150+ customers and provides micro segmentation security levels which essentially supports fine grained security firewall definitions almost at the VM level, there are over 150 NSX customers today. vCloud Air Virtual Private Cloud On Demand beta program supports instant, on demand consumption model for vCloud services based on a pay as you go model. VMware vCloud Air Object Storage based on EMC ViPR is in beta and will be coming out shortly. End-User Computing: VMware is integrating AirWatch‘s (another acquisition) enterprise mobility management solutions for mobile device management/mobile security/content collaboration (Secure Content Locker) with their current Horizon suite for virtual desktop/laptop support. VMware End User Computing now supports desktop/laptop virtualization, mobile device management and security, and content security and file collaboration. Also VMware’s recent CloudVolumes acquisition supports a light weight desktop/laptop app deployment solution for Horizon environments. AirWatch already has a similar solution for mobile. VMware is starting to expand their footprint into other arenas, with new support, collaboration and joint ventures. A new VMware OpenStack Distribution is in beta now to be available shortly, which supports VMware as underlying infrastructure for OpenStack applications that use OpenStack APIs. 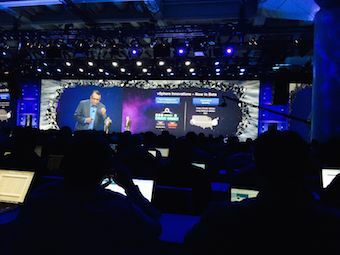 VMware has become a contributor to OpenStack open source. There are other OpenStack distributions that support VMware infrastructure available from HP, Cannonical, Mirantis and one other company I neglected to write down. VMware has started a joint initiative with Docker and Pivotal to broaden support for Linux containers. Containers are light weight packaging for applications that strip out the OS, hypervisor, frameworks etc and allow an application to be run on mobile, desktops, servers and anything else that runs Linux O/S (for Docker Linux 3.8 kernel level or better). Rumor has it that Google launches over 15M Docker containers a day. VMware container support expands from Pivotal Warden containers, to now also include Docker containers. VMware is also working with Google and others on the Kubernetes project which supports container POD management (logical groups of containers). In addition Project Fargo is in development which is VMware’s own lightweight packaging solution for VMs. Now customers can run VMs, Docker containers, or Pivotal (Warden) containers on the same VMware infrastructure. AT&T and VMware have a joint initiative to bring enterprise grade network security, speed and reliablity to vCloud Air customers which essentially allows customers to use AT&T VPNs with vCloud Air. There’s more to this but that’s all I noted. VMware EVO, the next evolution in hyper-convergence has emerged. EVO RAIL (formerly known as project Marvin) is appliance package from VMware hardware partners that runs vSphere Suite and Virtual SAN and vCenter Log Insight. The hardware supports 4 compute/storage nodes in a 2U tall rack mounted appliance. 4 of these appliances can be connected together into a cluster. Each compute/storage node supports ~100VMs or ~150 virtual desktops. VMware states that the goal is to have an EVO RAIL implementation take at most 15 minutes from power on to running VMs. Current hardware partners include Dell, EMC (formerly named project Mystic), Inspur (China), Net One (Japan), and SuperMicro. EVO RACK is a data center level hardware appliance with vCloud Suite installed and includes Virtual SAN and NSX. The goal is for EVO RACK hardware to support a 2hr window from power on to a private cloud environment/datacenter deployed and running VMs. VMware expects a range of hardware partners to support EVO RACK but none were named. They did specifically mention that EVO RACK is intended to support hardware from the Open Compute Project (OCP). VMware is providing contributions to OCP to facilitate EVO RACK deployment. Sorry about the stream of consciousness approach to this. We got a deep dive on what’s in vSphere 6 but it was all under NDA. So this just represents what was discussed openly in keynotes and other public sessions. We discussed last year’s vSphere 5 storage changes in a previous post. And at last week’s VMworld2012 in San Francisco, VMware announced a few new enhancements for vSphere 5.1 but showed more on their vision for the future of storage in VMware environments. VDP – vSphere Data Protector is a new agentless, deduplicating backup solution from VMware (and EMC) which is now bundled into vSphere and comes free for all users at the Essentials+ level and above. VDP is based on EMC’s Avamar Virtual Edition and provides a new integrated data protection management tab in vCenter Operations Manager GUI. VDP replaces VDR. vMotion changes – vMotion now supports non-shared storage and specifically, VSA storage environments. To do this vMotion will now perform a standard storage vMotion to the targeted host before the VM vMotion takes place to move the data to the new location. vSphere replication auto-failback with SRM – SRM 5.1 now supports vSphere replication service automated failback. SRM 5 supported storage array based replication automated failback but had no support for the then announced new VMware, host based replication service. This has been rectified with SRM 5.1. SRM packaging changes – SRM standard now comes at no additional charge with the vCloud Suite Standard license option. And a new entry level SRM (for 6 CPUs, 3 hosts) comes with Essentials+ to match and provide DR services for VSA environments. Virtual flash – VMware’s first internal support for server side flash. VMware will now be able to partition and allocate the flash on PCIe cards to VMs executing in the ESX server just like physical memory and vCPUs are today. Also VMware will be able to copy flash cache contents when vMotion-ing VMs to other physical servers. The intent is to fully support PCIe flash cards for vMotion by warm starting the flash in the target server and bring fast access storage closer to VMs. VSAN – also called distributed storage, takes VSA like services and scales it out to support many more hosts/CPUs and networked storage. The ultimate goal here seems to be to provide a shared, mid-tier, distributed storage system based on VMware DAS, which will better support vSphere execution and high availability. VSAN will provide compute and storage within the same host. It’s intended that VSAN be easier to configure, deploy and manage than current VM shared storage solutions. Where are they going with all this? I believe VMware is signaling an intent to get more involved in the storage arena. Last years move with VSA now seems like just the beginning. If examined together with their other thrusts for the virtual data center, it all starts to make sense. When these three future storage capabilities are in place, VMware should be better able to configure and support virtual cloud data centers (VCD) built out of commodity servers, commodity storage and commodity networking gear. With all this in place VCDs should be better able to compete with AWS and other cloud service providers. I was talking with one IT analyst, Dr. Kevin McIsaac with IBRS in Australia who feels when these three capabilities start rolling out, it signals the beginning of the end of enterprise storage as we know it. He compares this to what happened to specialized Unix servers (from HP, Sun, IBM, etc.) prominent at the end of the last century and early this century with the introduction of VMware and commodity high-performance, Intel servers/microprocessor chips. Although these proprietary Unix servers still exist they are no longer growing market share. In Kevin’s view, VMware is just following that playbook again, only this time it’s enterprise storage in their sights. Of course, the other side of this is the enterprise networking that starts to be commoditized by all the virtual networking capabilities VMware is rolling out in VxLAN and Nicira integration as well. (Perhaps subject for another post). I understand his point and can’t help but agree with parts of it at least at the low end and potentially mid-tier storage. IMHO however, enterprise storage vendors have a viable defense to all this but it involves providing even more functionality, performance and capabilities than they available today in their systems. I see it every time I look at my performance charts, anytime you start getting over 300 disk drives, storage sophistication matters more to performance, than just throwing more hardware in the mix. For an example of this effect checkout my last post on SPC-2 performance correlations. And of course, VMware might be straining their very profitable relationship with storage vendors today such as Dell, HP, IBM, NetApp, EMC, etc. all of which today highlight and push their virtualization solution throughout their partner community. If they decide to stop recommending VMware and start focusing on other virtualization offerings this might also stall VMware’s vision. In the end I can’t help but feel that in VMware’s view their challenge, in the long run will come from AWS, Google and other cloud service providers. Whatever they can do to better prepare to compete with this gaggle of cloud purveyors, the better they succeed for their enterprise customer. And ultimately that means more business for VMware. If enterprise networking and storage vendors have to adapt to that vision, then so be it. I did an article awhile ago for TechTarget on Virtual (machine) Disaster Recovery and discussed what was then the latest version of VMware Site Recovery Manager (SRM) v1.0 and some of it’s capabilities. Well its been a couple of years since that came out and I thought it would be an appropriate time to discuss some updates to that product and other facilities that bear on virtual machine disaster recovery of today. Recall that VMware’s SRM is essentially a run book automation tool for system failover. Using SRM, an administrator defines the physical and logical mapping between a primary site configuration of (protected site in SRM parlance) virtual machines, networking, and data stores and a secondary site (recovery site to SRM) configuration. Once this mapping is complete, the administrator then creates recovery scripts (recovery plans to SRM) which take the recovery site in a step-by-step fashion from an “inactive” to an “active” state. With the recovery scripts in hand, data replication can then be activated and monitoring (using storage replication adaptors, SRAs to SRM) can begin. Once all that was ready and operating, SRM can provide one button failover to the recovery site. NFS data stores can now be protected as well as iSCSI and FC LUN data stores. Recall that a VMFS (essentially a virtual machine device or drive letter) or a VM data store can be hosted on LUNs or as NFS files. NFS data stores have recently become more popular with the proliferation of virtual machines under vSphere 4.1. Raw device mode (RDM) LUNs can now be protected. Recall that RDM is another way to access devices directly for performance sensitive VMs eliminating the need to use a data store and hyper-visor IO overhead. Shared recovery sites are now supported. As such, one recovery site can now support multiple protected sites. In this way a single secondary site can support failover from multiple primary sites. Role based access security is now supported for recovery scripts and other SRM administration activities. In this way fine grained security roles can be defined that allow protection over unauthorized use of SRM capabilities. Recovery site alerting is now supported. SRM now fully monitors recovery site activity and can report on and alert operations staff when problems occur which may impact failover to the recovery site. SRM test and actual failover can now be initiated and monitored directly from vCenter serve. This provides the vCenter administrator significant control over SRM activities. SRM automated testing can now use storage snapshots. One advantage of SRM is the ability to automate DR testing which can be done onsite using local equipment. Snapshots eliminates the need for storage replication in local DR tests. There were many other minor enhancements to SRM since v1.0 but these seem the major ones to me. The only things lacking seem to be some form of automated failback and three way failover. I’ll talk about 3-way failover later. But without automated failback, the site administrator must reconfigure the two sites and reverse the designation of protected and recovery sites, re-mirror the data in the opposite direction and recreate recovery scripts to automate bringing the primary site back up. However, failback is likely not to be as time sensitive as failover and could very well be a scheduled activity, taking place over a much longer time period. This can, of course all be handled automatically by SRM or be done in a more manual fashion. At last year’s EMCWorld VPLEX was announced which provided for a federation of data centers or as I called it at the time Data-at-a-Distance (DaaD). DaaD together with VMware’s Vmotion could provide a level of disaster avoidance (see my post on VPLEX surfaces at EMCWorld) previously unattainable. No doubt cluster services from Microsoft Cluster Server (MSCS), Symantec Veritas Cluster Services (VCS) and others have also been updated. In some (mainframe) cluster services, N-way or cascaded failover is starting to be supported. For example, a 3 way DR scenario has a primary site synchronously replicated to a secondary site which is asynchronously replicated to a third site. If the region where the primary and secondary site is impacted by a disaster, the tertiary site can be brought online. Such capabilities are not yet available for virtual machine DR but it’s only a matter of time. 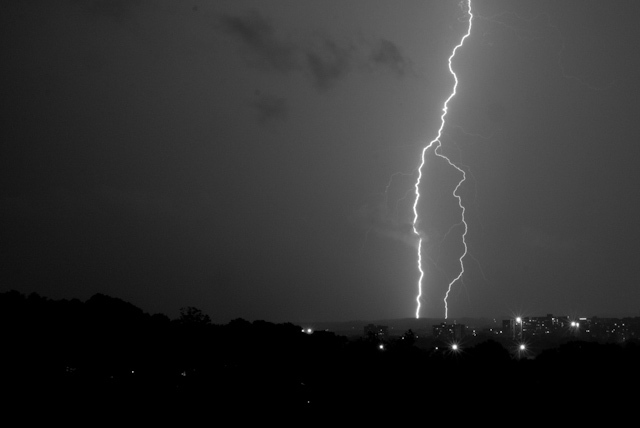 Disaster recovery technologies are not standing still and VMware SRM is no exception. I am sure a couple of years from now SRM will be even more capable and other storage vendors will provide DaaD capabilities to rival VPLEX. What the cluster services folks will be doing by that time I can’t even imagine.